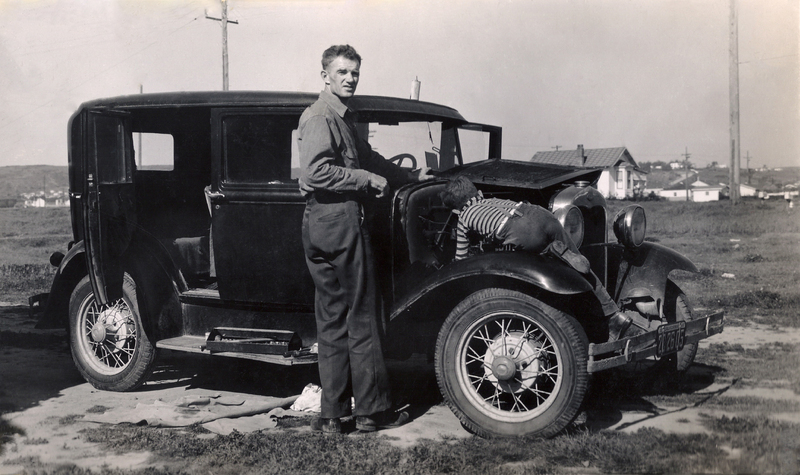 I love this photo of my great grandfather and his son fixing the car. The open door is so inviting, I want to hop in and go for a drive. My mom likes to say that when she and Grandpa Duval would drive through Montana on those long straight stretches, he would tell her to keep an eye on the road. His right eye was tired and he needed to close it for a while. Don’t worry though, his left eye was doing just fine. But if the car wasn’t staying straight she should just reach over and adjust the wheel. I wonder if he would try that trick on me? What do you say Grandpa, how about a drive? I’ll keep the car on the road for you so you can rest that tired right eye! Previous postAnybody Need a Lookup? What an endearing story; thank you for sharing it with us. Thank you Tracy, and thanks for stopping by! Ah, the good ole days when you could lift the hood and actually work on your car. Cute pic, even cuter story to go with it! Thank you. Those were the good ole days weren’t they? What a delightful photo! It holds so much. Thank you, I think so too! I love how the son is so engrossed, while the dad is distracted by the photographer. Such a great captured memory! Thanks Nate, I agree. I would love to know more about his moment. Did grandpa teach Frankie how to fix something? Was he just letting him tinker or tighten things? Oh so many more thoughts tumbling around about this moment.